I'm in an interesting situation... Few years back during my schooling , I came across a guy 'X' who played certain pranks on me..The pranks were not that serious , but sort of irritating enough for me to remember this guy even now... Much later I came across another guy 'Y', who really made some trouble in my life/career at-least indirectly.. And I was seriously irritated with him then.. Whether the changes that I made to get away from 'Y' was good or bad is another debatable thing.. But whatever, the connection between 'X' and 'Y' is that they share the same first name. NITC Special ==> Lost Symbols ? Alright , here’s the NITC special post. The usual disclaimers apply.. This might seem extremely irrelevant for all Non-NITC/CREC visitors to my blog. (3) This place hasn’t changed much..Isn’t it ? a new PG hostel, old PG modified, F’ ( F-dash , in NITC lingo ) extended to three floors, G ( which was almost complete when I graduated , two new ones behind that ( almost on the verge of completion ) ..Seriously are there this much students in NITC? There is a block each for the CSC & Electronics dept that has come up behind the old dept locations. I couldn’t go to valley..It seems that’s now off-bounds for students after some ‘incidents’ there :-) .. Basically to get into that entire walled area on the other side of road enclosing staff quarters, LH etc, u need to write ur name with security , take permission and stuff like that.. So, didn’t go there.. 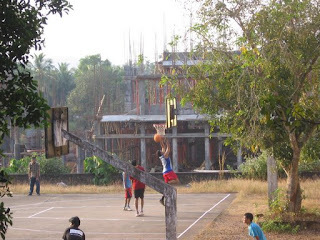 This sight pained me….No..not the basky court.. but behind that.. The FBG is lost !!! Some international library complex is coming up… Not that I was a football player.. but, this was one of the unique symbols in NITC.. The monsoon cup matches..Where do those take place nowadays ? In 12th mile ? I don’t know much about the incident ..May his soul rest in peace..
Basically talks about the list of projects done by some students under’Centre for value Education’ – I wonder if I can read those reports somehow..Sounds interesting ..
That’s closed now..Once that new library complex comes up, I wonder whats going to happen to this building ..
As I drove back to Calicut, all those memories came…friendships, rivalries, arguments, grief , laughter ..Ah..those 4 years.. Those 4 years from which I learned a lot.. Moments when I felt I had lost everything..Moments when I felt I had conquered everything…Illusions…Sigh!!! -- Impressed by Tata's One Lakh car, Sanjay Dutt chose that to gift a Tata Nano to his girl friend Manyata.. It also reports that he chose Nano over a 4 Crore car :-).. I wonder what Manyata's reaction was when she heard this 4 Crore - 1 Lakh swap ..Or call it economics of love .. Assuming he had 4 Crore money for this purpose, he can split it and give it to 400 girl-friends, past present and future.. No..I'm not cribbing about the time that I lose..But a different thing.... Something for which I yearned two years before didn't materialize then, but it did now..And now I'm in an entirely different situation...It the sense,it would have made me ecstatic two years back..but it is kind of making me indifferent now... Hmmm..Got to think . On another note..Who said two wrongs doesnt make a right ? It does atleast in software..
"Wrong Code + Wrong Test Case = Expected Results " -- I got that yesterday..Fortunately was easy to fix..